HOW DOES OBAMA COMMUNITY PROPOSAL COMPARE WITH TENNESSEE AND CHICAGO EFFORTS? Why focus on community colleges? First, because by any standards they are cost-effective open enrollment institutions whose goal is teaching, not research. Second, because they have such broad reach 8 million students. 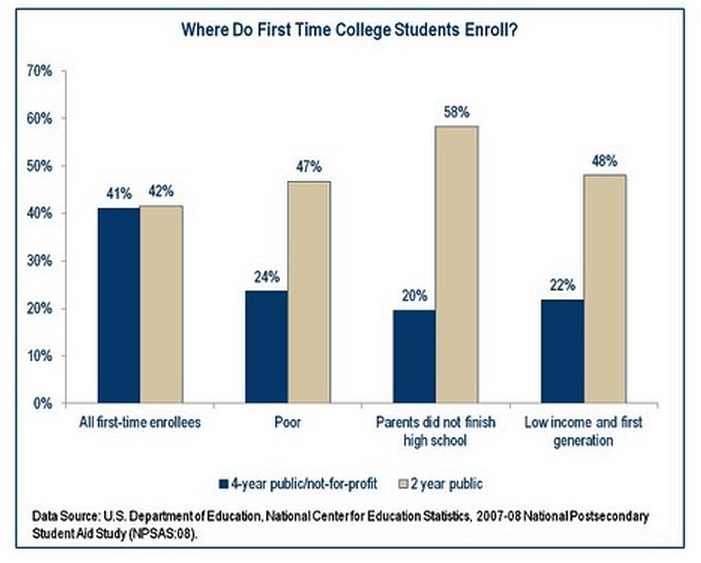 Community colleges are the point of entry for the majority of first time college students. As seen from the chart below, poor students and those whose parents did not finish high school overwhelmingly begin at community colleges. Obama's proposal draws inspiration from Tennessee Governor Bill Haslam's Promise program. That initiative provides for last dollar support - funding to augment financial aid - so that every Tennessee community college student pays no tuition at the state's community colleges. The United States once was a leader in education for the common citizen when 100 years ago free high school became the norm in our country. Now for most, college is the passport to economic viability. However, our education policy and practices have not caught up with this new reality. The Tennessee promise program and the Obama proposal are a recognition of this fact. Kerri Kane recently joined STCC as Director of Great Ideas, STCC’s idea system. Formerly Ms. Kane worked at Health New England (HNE), a Massachusetts health insurance company owned by Baystate Health System. HNE is headquartered in Springfield, Massachusetts and has just over 300 employees. At HNE Ms. Kane was responsible for leading their idea system called Opportunity for Improvement (OFI). Q: What similarities and differences do you observe in the idea systems in HNE and STCC? A: The program structure and functionality is very similar between HNE and STCC because they are both built from the same model developed by Dr. Alan Robinson co-author of Ideas are Free and Idea-Driven Organization. All of the idea boards look very much alike and the meetings are run in a similar fashion. Both idea programs are very focused on ensuring a positive customer experience as well as increasing operational effectiveness. Rapid changes in the healthcare industry like the Affordable Care Act (ACA) and HNE’s entrance into the Medicare and Medicaid lines of business brought great pressure to adapt. Often times, the organization grew without adding staff so we had the same number of people trying to accomplish a larger amount of work. The idea system at HNE gave associates the vehicle to bring forth ideas to increase their own efficiency and drive the changes needed in order to achieve the goals of the organization. Although the external forces of change may not appear to be as significant in higher education, I would argue that the highly competitive market in which it exists (particularly in Massachusetts) is an even greater source of pressure to change and ‘keep up.’ At STCC, the primary focus of their Great Idea system is the success of the student. STCC realizes that bringing value to the student is one of the keys to long-term success. I believe that is a tremendous differentiator for STCC. Q: What were some of the initial goals of the idea system at HNE? A: HNE was very focused on using the OFI system to engage employees through problem identification and solving. The yearly engagement survey has a question ‘My opinion matters at work.’ The OFI program gave everyone a place to voice their opinion, so year after year HNE achieves very high scores in this survey. Over time HNE began to shift focus from employee engagement to more sophisticated process improvement efforts that focused on transforming company operations, market penetration and healthcare delivery. Q: What is your impression of the goals of Great Ideas at STCC? A: My impression is that the college has three main goals: 1) improve services to students and the public; 2) increase employee engagement and team work; 3) make it easier for employees and the institution to embrace change. These goals are tightly linked and aligned with the overall goal of student success. Q: Can you talk about how an idea system breaks down barriers between departments in an organization. Sometimes people don’t understand how their work and/or role fits within the greater workflow (or process). When teams come together to solve an issue, it helps break down the siloed thinking that can happen when you simply ‘do your work.’ Working with a cross-functional team provides a greater understanding of the larger workflow and in turn supplies better solutions. Q: What kind of push back did you experience and how was it dealt with? A: Continuous improvement is not ‘another thing’ to do, but rather the way things should always be done. It is a struggle to build this into the organization and it is important that executive leaders take the lead to gain buy-in from all employees or this can be hard to overcome. However, I believe it has great benefits, long term benefits for any organization that can stay the course. Q: What helps promote the OFI system? A: Leadership engagement and ongoing commitment is the number one factor in the system’s success. Without diligent support and promotion from the leaders within the organization, the system will break down. For some leaders an idea system such as OFI or Great Ideas at STCC is difficult because it requires that they relinquish the problem solving control to the people doing the work. It can be hard to admit as a leader that you don’t know everything and to trust your front line employees. This change in behavior requires humbleness and for some a complete change in leadership style. HNE is now piloting a leadership development program that helps build the skills needed to be successful in ‘coaching to solve.’ Leaders will be trained in small group facilitation, coaching, and learning to develop their own (and their team’s) problem solving capabilities. I am aware that STCC has set up similar training for leaders and team facilitators.